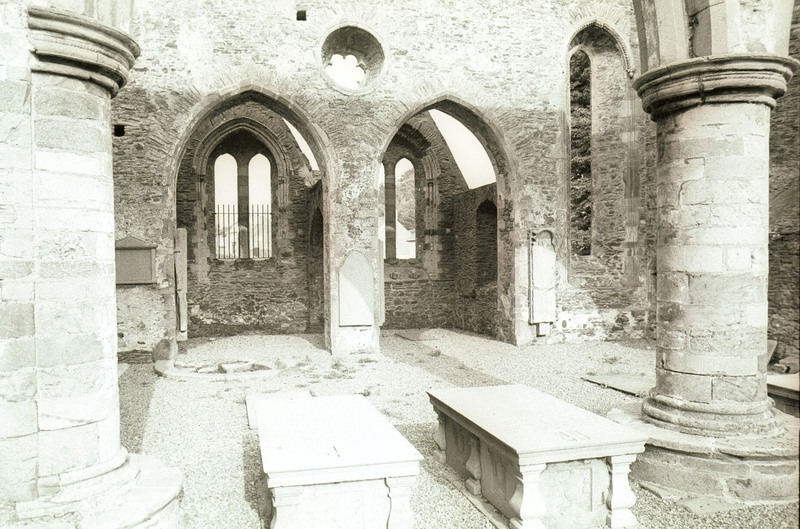 “St Mary's Parish Church, New Ross, Co Wexford, interior - south transept, east elevation, twin eastern side chapels,” Gothic Past, accessed April 22, 2019, http://gothicpast.com/items/show/1177. Photograph by Roger Stalley. View of south transept from the west showing paired side chapels beyond east elevation. Two bay arcade of transept has cylindrical piers with bell capitals, water - holding bases and chamfered soffit mouldings. Arches to side chapels have similar chamfered mouldings and a circular sexfoil window in the spandrel overhead. Side chapels,divided by an arch, each have paired lancet windows in a single embrasure. The south elevation of the southern - most chapel has a single lancet window. Arch mouldings on these windows, including an inner row of dogtooth, rest on cranial capitals and bonded shafts. They are surmounted by hood mouldings with dogtooth ornament and cranial label stops. The ornamentation of the most southerly window is less well preserved. The south - eastern corner of the transept shows a single lancet window, the rere - arch is moulded with a roll - and - fillet.